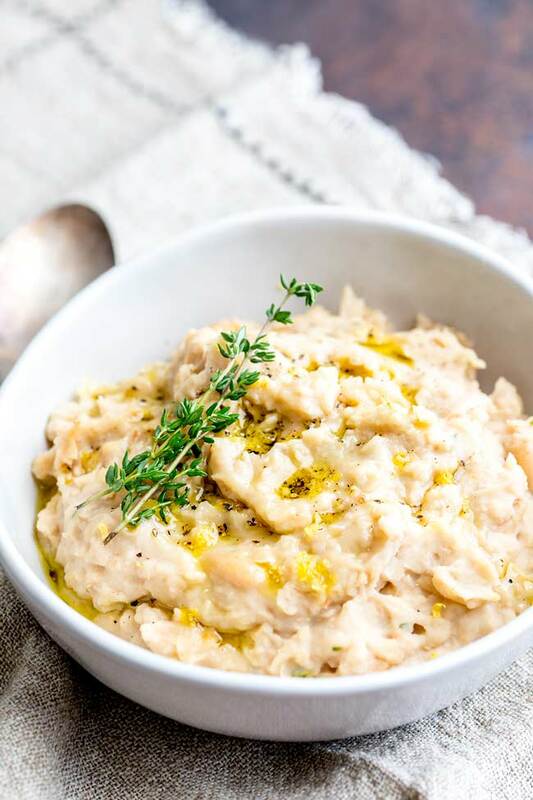 This Easy White Bean Mash is a great speedy vegan side dish. Full of protein and fibre and you don’t have to worry about peeling potatoes. | Simple, delicious and healthy. Bean mash is so quick and simple. 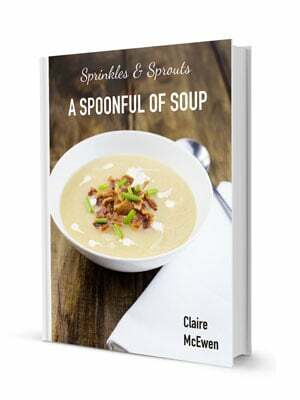 You heat the beans with some stock, and then mash to create a wonderfully rustic and easy mash. If you don’t have a potato masher don’t worry, this bean mash is made by using a fork/spoon. What to serve with bean mash? 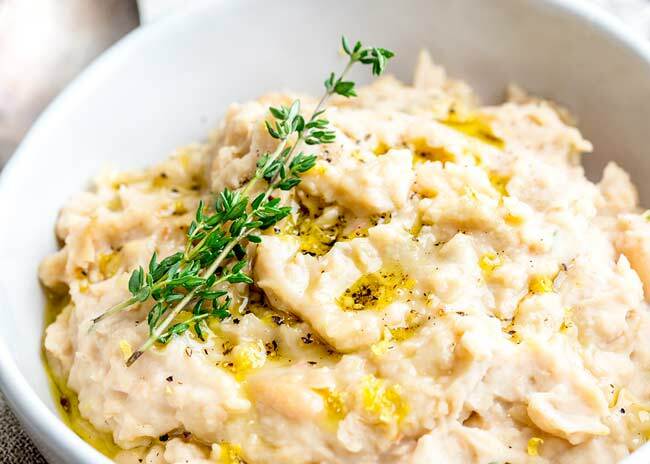 This Easy White Bean Mash is a great speedy vegan side dish. Full of protein and fibre and you don't have to worry about peeling potatoes. | Simple, delicious and healthy. Drain the beans and rinse under a tap. Add the olive oil to a small pan, pull the leaves from the thyme sprigs and add them to the oil. Place over a low heat and gently warm the oil. Once the thyme starts to smell aromatic, add in the drained beans, the zest of the lemon and the vegetable stock. Stir over a medium/low heat until the beans are warmed through. Use your wooden spoon (or a large fork) to squash the beans into the stock until you have a rustic mash. Check your seasoning and serve drizzled with EVOO. Actually I am just shattered and am looking forward to curling up in bed with a cup of tea and my book. YES I am middle aged!!!! 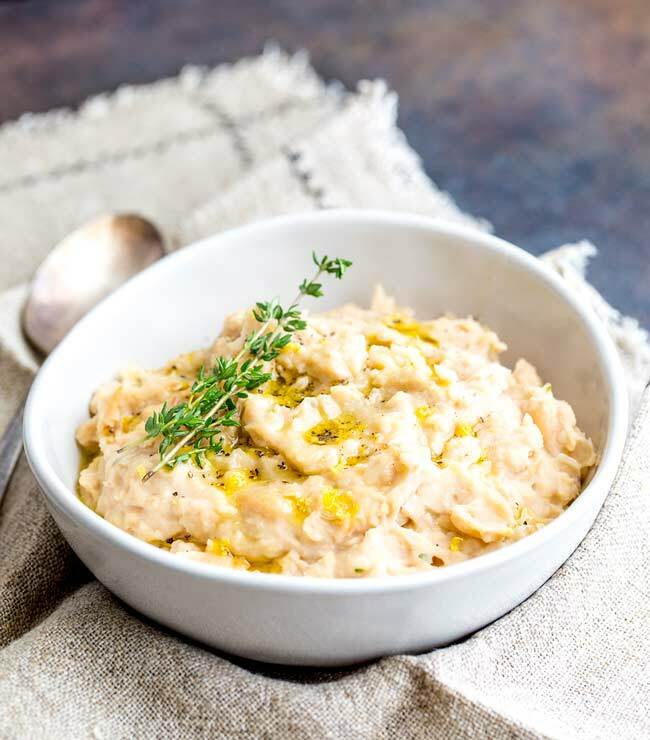 If you love food why not subscribe to my newsletter, I will drop you an email every now and then, just to say hi and send you a couple of recipes think you might love, like this Easy White Bean Mash with Lemon and Thyme. It sounds amazing bean mash. Definitely, want to try this. Thank you Chelsea, it is a great mid-week staple! What an awesome idea! I am loving this. This totally would have been perfect to serve with these braised short ribs I just made! Okay, you blew my mind with the idea of just mashing up beans instead of peeling potatoes, which is like one of my least favorite kitchen duties ever! These sound so good! And I love beans in all forms, but especially with the lemon and thyme that you used! Yum! I was so happy when my boys enjoyed mashed beans!!!! What a simple but gourmet sounding recipe! I love white beans but never have had them “mashed” before. Yum! Can’t beat a simple recipe like this that is healthy AND delicious – thanks for sharing! I have never had anything like this before but it looks so delicious that I can’t wait to try it! I love the idea of a bean mash and I can’t believe I’ve never thought of it before. So simple and delicious! This looks so comforting and like you say, rustic. After a busy day having a mash in under 10 minutes sounds perfect. I’m going to try this tomorrow with our chicken and gravy. And it really is perfect for the end of a busy day. Chicken, gravy and mash sound delish! What an amazing idea, Claire. I bet this tastes very similar to real mash, but it’s full of protein. Great for vegans and non vegans alike. 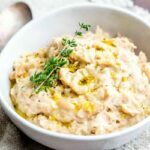 I’ve tried cauliflower mash, now i need to try this too!